Start with an initial base of waterskiing, convert that to slalom, and add a good measure of skateboarding. Blend in five ounces of snowboarding and a cup full of surfing. Switch feet and stir again. Let it set until confidence starts to rise. THEN, add acrobatics to further leaven the mixture. Stir again, 180 and then 360. Whip it until it pops. Spritz it with ‘rad’ lingo. Ride the butter! A Feast of Footwork Feats! ‘Quick Feet’ is a vast underestimation of a table tennis player’s footwork as he reacts to the speeding, probably spinning, light-weight ball. An advanced-level player shifts from his ready position, moves up to five feet, and does a full body swing to return the shot, all in less than half a second. (1) Indeed, competitive players resort to physics to calculate how they can improve their acceleration time and distance between strokes from their stationary ready position. The crouching, never slouching, always coordinated, sometimes explosive body movements typify table tennis moves. Ping pong – the original, onomatopoeic name – is a sport of long rallies and sharp-angled shots. The ‘footwork field’ is far smaller than other racquet sports, only 20 feet by 40 feet; the table width is only 5 feet of the 20. Ping pong players must move around on their own side of the net and make calculated offensive or game-changing defensive shots from different heights and distances. Table tennis footwork requires precision. Mastery of basic footwork patterns is the key to success at advanced levels of competition. Small steps get players in perfect position for spectacular shots. Ready Position – The right-handed player returns to a left-of-centre angle on possible shots. Crouching forward with feet shoulder-width apart, he balances on the balls of his feet, heels lightly touching the ground. His left foot and left shoulder are slightly forward. The tip of his paddle can barely touch the table’s edge. One-step to the side – To cover a wide backhand, he shifts weight to his right leg and pushes his left foot further to the left. Two-steps to the side – To take a wide forehand, he leans on his right leg, pulls his left foot towards his right foot. Then he quickly shifts his right foot to the right. This is a side-skipping move. Three-steps to the side – An incoming shot lands deep to the forehand corner, angling off the wide forehand sideline. Or, the player needs to step out wide on his backhand side to hit a forehand. This is two-step but with a preliminary small step. Moving right, he takes a small step with right foot and shifts weight to his right leg. Then, he performs a two-step movement. Softball bears a striking resemblance its first cousin baseball but for a few distinguishing features. Its ball is bigger, its field is smaller and its game is shorter. Softball has a wild card trait. The pitch is thrown underhanded. As it moves through the air, the ball can loop up, curve or drop down. Pity the waiting, watchful batter. The catcher is well aware of what the pitcher is delivering. Having weighed the innings and outs of the game, the catcher selected the right pitch for the moment and covertly instructed the pitcher. This is the same trusting rapport that their cousin pitchers and catchers enjoy; they collaborate in besting the batter before she knows what hit will come of it. Softball’s groundwork begins with the players preparing their routine footwork before the ball is even thrown. She crouches: feet shoulder-width apart, knees bent with weight distributed through the inside balls of her feet. She doesn’t sit back on her heels nor do her knees go beyond her toes. Her back is straight and she is balanced in this low squat. Before moving into the receiving stance, the catcher has a slightly different set up while signaling. She is slightly forward on her toes, dropping her glove to block the signal from the wrong eyes but ensuring it is visible to the pitcher. She moves into receiving stance. Ball in hand, before stepping onto the 24-inch rubber on top of the pitcher’s mound; she stands square to home plate with hands apart. Within ten seconds, she brings her hands together then separates them, takes a backward step with her non-pivot foot, still on the rubber, as she begins the one arm wind up for the pitch. Even in its familiarity, the balance beam is still a daunting piece of athletic equipment. Long and narrow, it is raised about 4 feet (1.2 m) above the floor. Walking on the balance beam is where beginners start. Elite-level gymnasts jump, turn, run, kick, flip, do cartwheels, pirouettes, mount and dismount with seemingly effortless precision. The riveting repertoires in this sport demonstrate creativity and control like no other. Stand at one end face the beam’s length. With chest high and abdominal muscles contracted, place left foot in front of right. Turn feet out slightly and distribute weight evenly on balls of feet. Keep toes on top of the beam to prevent ankles from rolling. Align kneecaps with feet. Point arms up above head toward ceiling or extend arms like airplane wings. Looking straight ahead, step forward with right foot. Point toes and place the heel of right foot securely on beam. Continue forward, alternating feet until reaching the end of the beam. 2012…..split leap mount, front tuck, two flip-flops to a layout, swing down, split leap, switch ring leap, front walkover, swing down, side aerial, sheep jump, back tuck, wolf jump, split leap, full turn, two flip-flops to a double pike dismount. 2008…..two flip-flops to a two-foot layout, front pike, standing full, switch leap, layout step-out, two-foot layout, switch leap, split jump, pike jump, back tuck, full turn, cartwheel to sit, round-off, full-in dismount. Some pros can quickly scan your golf stance and predict how you will swing. Good footwork makes for good club swings. Alignment to the target, proper rotation and weight transfer, it all follows through. The corollary is also true: poor, overactive footwork can disrupt the overall swing rhythm. Golfers practice self-examination with every stroke; drills at the driving range follow the diagnosis. Problems and symptoms get analyzed and eliminated, whether it is toes up in the downswing, falling back on heels, or hitting from the back foot. Golf is a difficult game played by professional and occasional perfectionists. Remedial golf is the norm. Yet, baseline readings on what needs to be corrected can differ in the way that western and eastern medicine do. Some say ‘change your foot action’ while others say ‘footwork is passive, not active’. Both high-and-low handicap players struggle with their footwork. They look to their feet when they can’t place the ball. Again, the corollary is true: when golfers are swinging well, they feel it in their feet. Step 2: During your follow through, lift up your right heel. Road cyclists are avid, even over-the-top enthusiasts for their sport. Nose to tail, they seem to ride in packs. Drafting is all part of the competition. They move through air turbulence together, sharing the benefits. Roadies have a handle on what is happening technically and biomechanically as they pedal their bikes. They know how to increase energy and efficiency by engaging new muscles and ‘spreading the load’. They purposefully ride vortices in wakes. Based on the cadence (RPM), they adjust to high- or low-heel pedaling techniques. They demonstrate how effort in pedaling combined with gravity affects acceleration and deceleration. As experienced bicyclists, they can transfer power and avoid ‘the dead spot’. They’ve revived talk of ‘ankling’, an old technique. It entails “drawing force across the bottom of the revolution arc and upwards to the start of the downward thrust”. (1) Roadies’ ‘talking the walk/ride’ feeds their own enthusiasm. “As the foot nears the top, think about pushing your knee toward the handlebar”. “Pretend you’re scraping mud off the sole of your shoe”. These cues are ‘activated’ well in advance of when the foot is actually at the top or bottom of the pedaling action. (2) The roadies are on it! In a travelling exhibit, high-end retailer Holt Renfrew partnered with the French Embassy to reveal what the highest price items are made of. 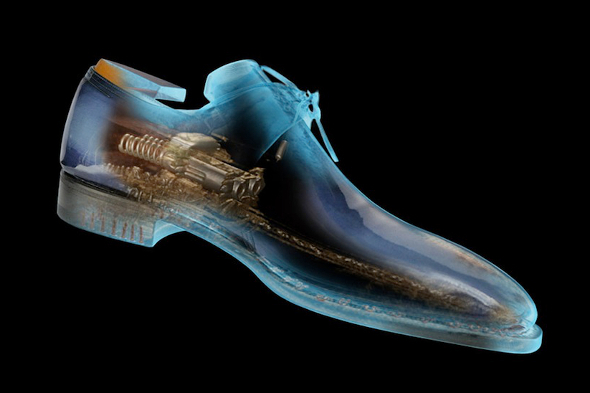 Combining art and science, Paris-based journalist Laurence Picot used a medical scanner and photography to examine fourteen top luxury items. These included the new Hermès saddle, the S.T. Dupont lighter and Pierre Corthay shoes. “LuxInside – Traces of Man” offers an inside view of excellent craftsmanship. “The principle behind luxury products is that you should not see signs of human innovation or the work that went into them,” Picot explained. Nevertheless, she was fascinated by the manufacturing processes and the people involved. Unsurprisingly, luxury retailers were unwilling to reveal the inner qualities of their designs. This only set Picot and a collective of artists and scientists onto an investigation that “diagnoses” the talent, the traces of what man has produced. You may have wondered aloud at the $1,000 price tag for a pair of red-soled Christian Louboutin heels. There’s more to luxury than meets the eye. It is the use of a very durable, costly metal — originally patented for the aircraft industry — to structure the heel and sole, resulting in a heel that will properly support a women’s ankle and stand the test of time. The exhibit arrived in Canada after its tour of Europe and South America.